I love making shortbread cookies. 1.) ...because they are so easy 2.) ...because how can you not love buttery, rich cookies? Also, they aren't incredibly sweet, which is nice...sometimes. This year, I played around with a brown and white sugar recipe. They came out great! I decided to divide the dough into five different flavors for Christmas cookies. The best part about this shortbread recipe is that you can make ONE dough and divide it into five parts. Then, you adjust each fifth by adding a few ingredients and/or dipping them in chocolate, etc. It's a great way to make a nice Christmas cookie platter for a gift or party without having to make several different doughs. In a large bowl, cream butter, white, and brown sugar until light and fluffy. Slowly stir in flour and mix well. Knead the dough on a lightly floured surface until smooth. Pat into a rectangular block, then cut into five even parts. Preheat the oven to 300º, so it can heat while you prepare the "add-ins". Three of the parts will have "add-ins" before baking, and two of the parts can be baked just how they are (white chocolate peppermint and salty turtle). Place the "add-ins" into three different bowls. Then, knead the three doughs into the add-ins (you can just knead them in the bowls, since it's such a small amount). I like to press the dough between two pieces of wax or parchment paper, then roll it out. That way it doesn't stick to the rolling pin. After rolling the dough, cut shortbread into 2 in. x 1 in. strips. Optional-Sprinkle the rosemary lemon walnut cookies with white sugar before baking. Place dough 1 in. apart onto ungreased cookie sheets. Prick with a fork to make them even prettier if you like. Bake at 300º for 25 minutes or until the bottoms are lightly browned. Allow cookies to cool on pan for a couple of minutes before transferring them to a wire rack. Now it's time for the toppings! Place walnut piece gently into the tops of cookies when they just come out of the oven. Spread orange zest over cookies while still warm. Melt butter in small sauce pan over med-high heat. Add milk and rum extract once butter is melted. Remove from heat. Slowly stir powdered sugar into mixture. Paint onto cookies. I like to paint a thick glaze onto each cookie. Sprinkle nutmeg over cookies. It won't take much nutmeg to add flavor to each cookie. Crush peppermints in a plastic bag, so they don't go everywhere. Melt white chocolate in a double boiler, then dip cookies halfway. Allow the chocolate to set on wax or parchment paper. While it's still warm, sprinkle with crushed peppermint. Melt 1/2 C of chocolate in double boiler. Once completely melted, remove from heat and add remaining 1/4 C of chocolate to melted chocolate. This mimics tempering, so the chocolate will harden faster. Dip cookies into melted chocolate halfway up. Sprinkle with chopped pecans while chocolate is still warm on cookies. Next, lightly sprinkle sea salt onto chocolate by hand. Then, melt caramels in microwave at 15 second intervals, stirring between. Once melted, use a fork to drizzle caramel over cookies. And...here they are! This isn't all of the cookies that this recipe makes just fyi. Below is a list of the ingredients you will need for the whole project, so you can see them all together. Keep in mind that you can just divide the dough two, three, or four ways, then make adjustments to the add-ins and toppings. I'm going to make these cookies again before Christmas, and I will probably divide the dough two ways, making one half salty turtles (the most popular among my family!) and one half white chocolate peppermint. Thanks Winnie. Shortbread cookies are def always yummy! All the best with your cute little boy and the one on the way! LOVE this post and these cookies look divine! 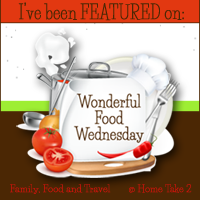 Thank you for linking up last week for Wonderful Food Wednesday - you are our featured blogger this week! Come on over tonight to check it out.